Cleaning and deodorizing dumpster areas around restaurant and food service areas has long been a difficult challenge for restaurant owners and franchise operators. No matter how often you clean the area, especially in the hotter months like now, the smell of decomposing food is very upsetting and the odor is not good for business. Typical odor control products have a temporary effect on smell, but within hours the odor is back - with a vengeance! 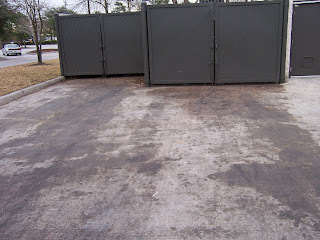 As a result, many operators actually call in the refuse removal company before the bin is full, just to reduce the odor. Now, with the introduction of EATOILS™ SUPERFRESH™ for cleaning and deodorizing dumpsters and the areas around garbage bins, restaurant owners can take control of those nasty odors and keep their facilities smelling fresh and clean at all times. This product is GREENER-CHOICE™ APPROVED GREEN, contains no harmful ingredients, is safe, biodegradeable, and meets all requirements for safe disposal. 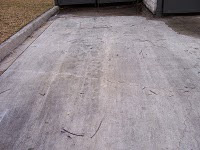 The photographs here show a dumpster area behind a Chick Fil A restaurant in Houston, TX, before and after cleaning & deodorizing with SUPERFRESH™. There is still some rinse water that hasn't evaporated just in front of the bins, however, you can easily see that the residual food has been cleaned - and the odor has been removed as witnessed by the fact that the client has now signed up the contractor to clean and deodorize the area on a regular basis. Many restaurant owners now insist that their cleaning contractors use EATOILS™ SUPERFRESH™ for their garbage bin areas and EATOILS™ BT200™ for their Drive-Thru's and parking areas(to remove oil and grease stains).